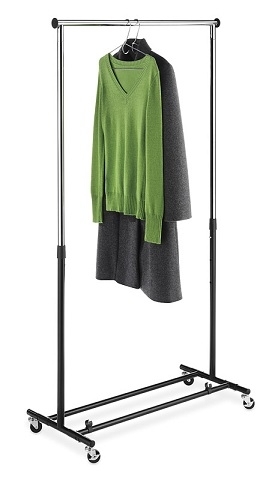 Dimensions: 17" W x 35.75" L Height adjusts: 42" to 66"
If you're not short on clothes but are short on space in your little college dorm room, it can be a bad combination. Your college closet will likely be around half the size of your closet in your bedroom back home, and while you probably won't be bringing your entire wardrobe with you, you can run out of space quickly. It's true that the right dorm room organizers for closets can help you maximize efficient use of space. Yet sometimes you need something extra ... such as an extra closet! This Folding Dorm Clothes Rack isn't a full closet, but that extra bar up top will give you just the space boost that you need to fit all those clothes and even some other dorm supplies. 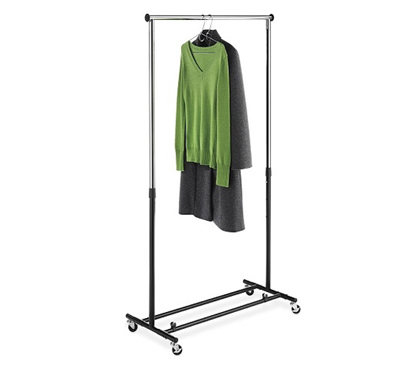 Whether it's more hanging space for your out-of-season winter clothes or a more less-crammed means of storing nicer, formal clothes, this extra clothes bar will come in handy. As its name implies, it can be deconstructed and folded up for easier storage and transportation. You can even hang a hanging dorm shelf for more surface-area storage space. College life requires plenty of outfits, from everyday clothes to times when you'll attend more formal school-related events and activities to times when you need your old clothes to go hiking. Fitting them all in that dorm room can be an issue ... but not if you have this Folding Dorm Clothes Rack!